Osteopathy was founded by Dr. Andrew Taylor Still in 1874. Dr. Still was years ahead of his time when he identified the significant relationships between structure and function in the human body. He recognized the importance of sufficient arterial and venous blood flow, lymphatic and neurotrophic flow and their relationship to the patient’s overall health. He began to develop a form of manual medicine which is currently practiced worldwide. Osteopathy is a philosophy as well as a science. It is a holistic form of hands-on medicine, which recognizes that the Spirit, Soul and Soma are a whole. Osteopathy is about supporting the health of the patient, and not sacrificing the whole to treat a part. As a very spiritual man and divergent thinker, who overcame several life challenges, Dr. Still always lived very close to nature and he taught that Osteopathy is the expression of the natural world. It is said that Osteopathy was alive well before Dr. Still put it into a format. Our goal as Osteopathic Practitioners is to learn about the natural laws using our perceptual skills which we develop in our training and daily practice. Dr. Still began his study of medicine in the 1850s under the tutelage of his father, who was both a physician and Methodist missionary. In 1855, Major James Burnett Abbott, a close friend of Still’s, confided in him that he had lost faith in present day medicine. He went on to say that he was convinced it was all wrong, and that the system of drugs as curative agents would someday be overturned, and some other system of curing illness without drugs would have its place in healing the sick. From that moment on Dr. Still was propelled to discover and develop a new system of medicine. Dr. Still continued practicing as a medical doctor but he excitedly explored bone setting and magnetic healing. But, in the spring of 1864, Dr. Still’s family was devastated by spinal meningitis. He stood looking upon three members of his family - two of his own children and one adopted child - all dead from spinal meningitis, and he seriously questioned medicine and God. In the end, he decided that God was not a guessing God but a God of truth. He believed that the body of man was God’s drugstore and had in it the wisdom that God thought necessary for human happiness and health. Still continued his study of anatomy and confirmed that it revealed masterful handiwork. He examined every bone in great detail, using cadavers from an epidemic of cholera. It was said that he was not seen without a bone in hand or in pocket. He correlated his in depth knowledge of anatomy with his observations of nature and reflections on creation. Dr. Still was eager to present his new idea and method of treatment to the medical community. He chose Baker University as the place to present his new ideas, a school which the Still family had helped found. However, the university refused him, and so did the community. In 1874, Dr. Still was publicly removed from the Methodist Church in Baldwin because of the “laying of the hands.” He was accused of trying to emulate Jesus, was labeled an agent of the devil and condemned as practicing voodoo medicine. Socially and professionally ostracized and penniless, he and his family were forced to move to Macon, Missouri, in 1875. It was here that Dr. Still preformed the first recorded Osteopathic treatment on a four-year-old boy with bloody flux (hemorrhagic gastroenteritis). Osteopathy is a philosophy as well as a science. It is a holistic form of hands-on medicine, which recognizes that the Spirit, Soul and Soma are a whole. Determined he was on the right path with Osteopathy, Dr. Still and his family settled in Kirksville, Missouri, and he began practicing what he developed. His reputation eventually spread, and soon enough people from all across the US were traveling to Kirksville to be treated by Dr. Still. As his reputation increased, so did the attacks by his former medical colleagues and some family members. Still was labeled a quack, a faker and a man who had lost all reason. He was outcast by many, but not all. There were an increasing number of doctors and residents who were drawn to Still and his newly found treatment modality. 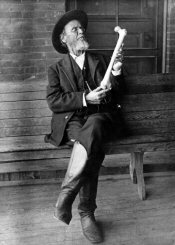 In 1892, the first formal classes in the teachings of Osteopathy began in Kirksville, Missouri, which later became the American School of Osteopathy. In the year 1900, as the science continued to establish itself, a student named William Garner Sutherland had a flash of insight. He wondered if the bones of the skull moved like the gills of a fish. He turned to question Dr. Still and it is said the old doctor advised him to think of the fluids. And so through dedicated study, observation and self-experimentation over a period of 40 years the concept of Cranial Osteopathy came to fruition. He then spent the last 15 years of his life teaching others the cranial concept and he never failed to emphasize that the cranial concept was only an extension of Dr. Still’s science of Osteopathy. Today, Osteopathic Practitioners live what Dr. Still taught. Osteopathy has always been an oral tradition and its rich history accentuates our philosophy and our core principles. Its teachings and the hands-on skill and treatments are taught and handed down directly from teacher to student. This is how Osteopathy has been taught since its conception, and still continues to this day. It cannot be learned through a textbook or observation. It must be experienced. As our scientific understanding advances 150 years later, many of Dr. Still’s insights are finally being credited today.